Frank Trowman, a crew member, brought his Super 8 cine camera to one of our Monday evening drill sessions in 1975. He filmed the crew turning out, and attending a mock road accident. It's difficult to decide which is the most disturbing, our acting or our casualty handling! It was never intended to be a serious documentary, and in any case, the technology of the day wasn't up to it. 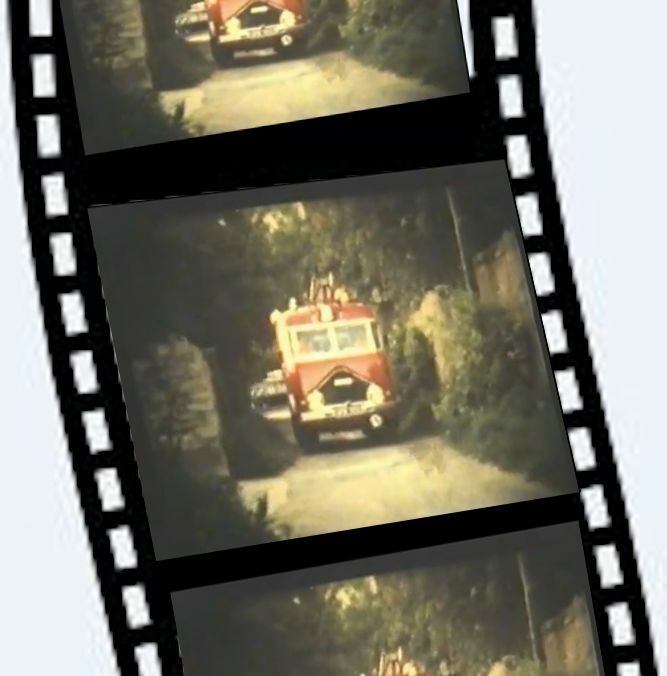 A reel of film lasted for little over three minutes, and there was no practical way to edit or re-shoot. However, after the passing of more than forty years it's interesting to see the long hair and primitive fire kit. Then use your browser's back arrow to return here. 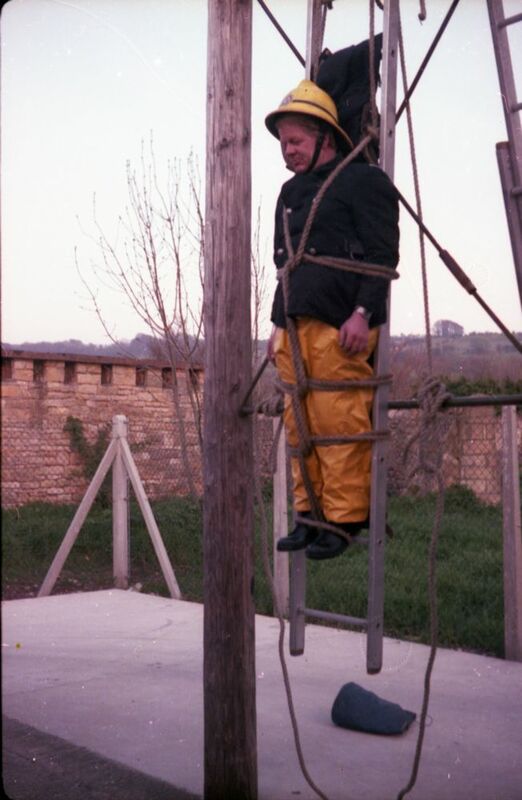 This is not, as it might appear, a punishment, but the use of a ladder as an improvised stretcher to lower a casualty. Les, acting as the casualty, has been tied to a ladder, and then hauled up the hose drying tower. The tying to the ladder is in accordance with the drill book of the time, but it's not so certain that he should be hoisted so far off the ground. The Drill Book specified the use of a dummy in that case. 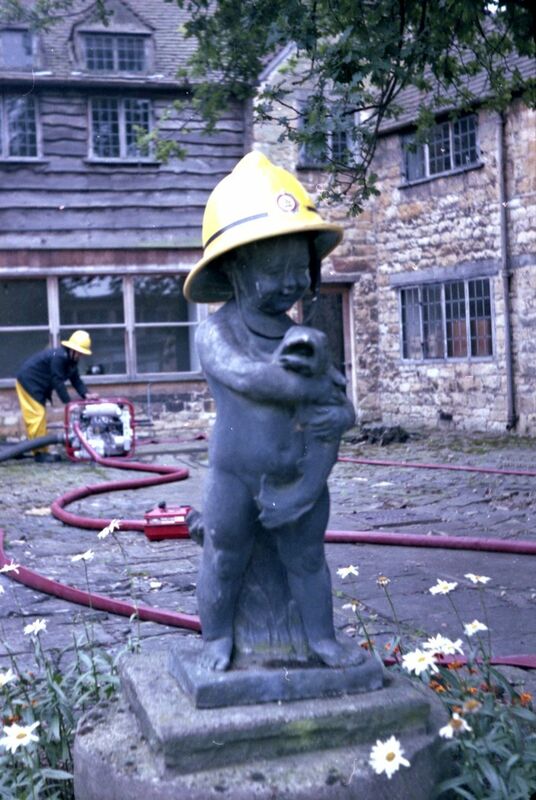 The statue has been promoted to Leading Fire-Fighter. He plays with a fish whilst his crew members pump out a flooded cellar at Gordon Russell Ltd's offices in Broadway. In the August of 1990 a large area of the Malvern Hills was on fire. On the first day there were at least twenty-five pumps in action. 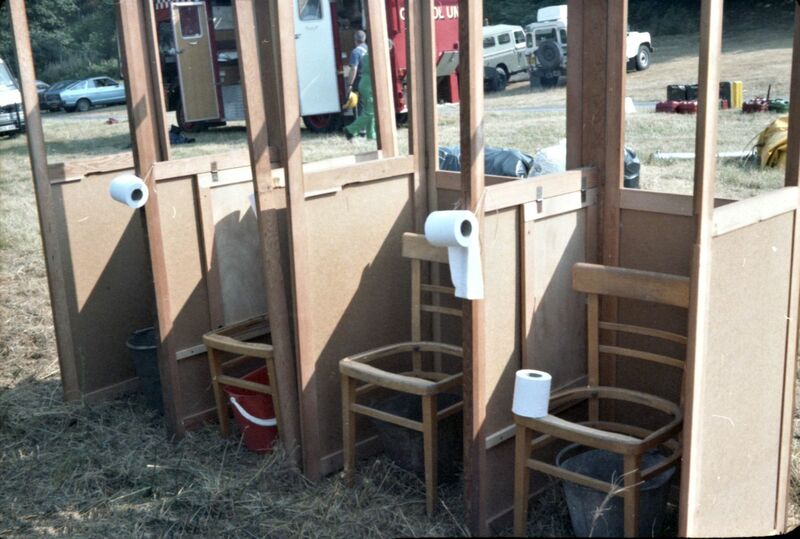 It appears someone was delegated to improvise some toilets for the many crews. Whilst full marks are due for ingenuity, history doesn't record whether they were ever put to the test! The sharp eyed observer will have spotted that upside down polling booths have been utilised. 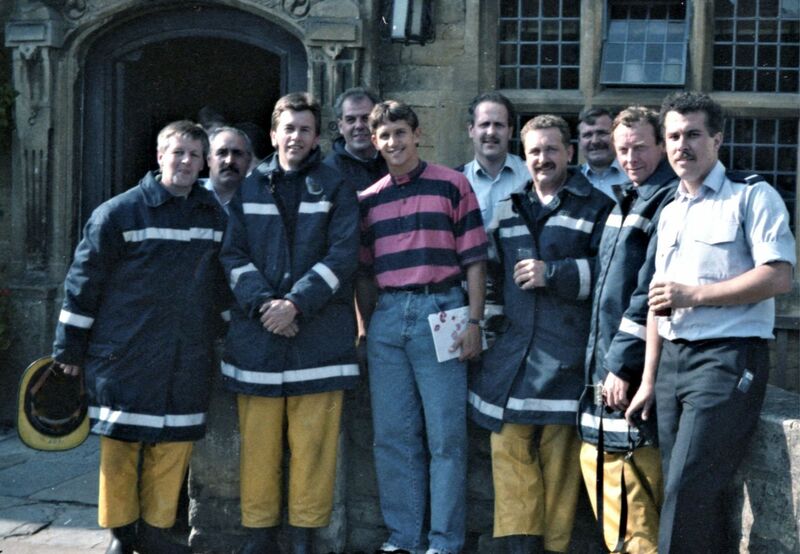 The Broadway crew, and a crew from Evesham, had a surprise after attending a false alarm at The Lygon Arms Hotel. Who should be strolling down the street but footballer Gary Lineker. This was only a very short time after his appearance in the 1990 World Cup. The crews posed with Mr Lineker, whilst the photographer (the author of this site), not being a football fan, wondered what the fuss was about. Frank Trowman, Nigel Dyde, Tim Crump and Andy Simms.